Nasturtium plant, Tropaeolum majus, is a highly decorative plant, whose foliage and large red and yellow flowers are a colourful addition to salads. A pepper substitute. Immature green seeds may be substituted for capers. Nasturtium plant is native to Central and South America. Adaptable to most soils and positions. Drought resistant but drought tender. A climbing perennial, growing to 0.6m x 0.3m. Trumpet shaped flowers appear in summer. 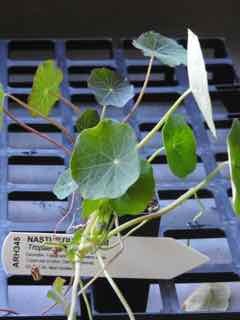 Be the first to review “Nasturtium, plant” Click here to cancel reply.